If a football referee takes a single step on the pitch, the turf does not look much different to him than before. For microorganisms, the conditions under his two feet can be completely different. Relative to their size, two microorganisms that are a referee’s step away from each other are as far apart as a person in Frankfurt is from someone in Florence. On this scale, of course, we all notice that environmental conditions, such as the weather, change. 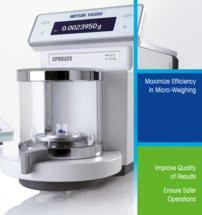 The conditions that microorganisms are exposed to vary similarly, only on the minutest of scales. 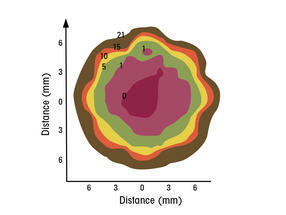 For example, the oxygen concentration in soil can differ significantly just a millimeter further on (Fig. 1). Over time, too, soil sees very frequent and rapid changes in environmental conditions, for example when it starts to rain, a cloud covers the sun, a fruit falls to the ground or twilight sets in. Microorganisms live and have always lived with constantly changing circumstances, such as a sudden shift in nutrient availability (referred to as "feast and famine"), long periods of drought or the appearance of foes. As a result, microorganisms have evolved strategies to deal with this uncertainty. Five of these are briefly outlined in the following paragraphs. Many bacteria possess flagella, long cell protrusions that allow them to swim actively. These propel them at amazing speeds, at least when measured in "body lengths per second” (bl/s). The fastest bacteria reach 400 to 500 bl/s, much more than a sprinting cheetah with only 20 bl/s. Some bacteria have receptors for nutrients, allowing them to sense substance gradients in their surroundings and swim towards higher food concentrations (“chemotaxis”). Many photosynthetic bacteria possess light receptors, enabling them to move to places with a higher light intensity where they can generate more energy through photosynthesis (“positive phototaxis”). Although bacteria do not get sunburnt, UV light is harmful to them, too, and can trigger mutations in their genome. However, many bacteria also have receptors for UV light, allowing them to escape from it (“negative phototaxis”). Receptors for oxygen enable some bacteria to swim towards higher oxygen concentrations (“aerotaxis”). And, last but not least, there are bacteria that even have the ability to orient themselves in response to the Earth’s magnetic field (“magnetotaxis”). In addition to swimming, bacteria have developed other forms of mobility. For example, many aquatic bacteria can synthesize tiny gas-filled bubbles (“gas vesicles”) by which they regulate their own density to either float towards the surface of waters, where there is plenty of sunlight and oxygen, or to sink to a certain depth in a lake where the overall conditions are optimal for their metabolism. Another form of forward movement is to glide on a self-produced base of slime, as many soil bacteria do. All types of locomotion involve perceiving signals from the environment in order to swim, float or glide towards more favorable conditions. 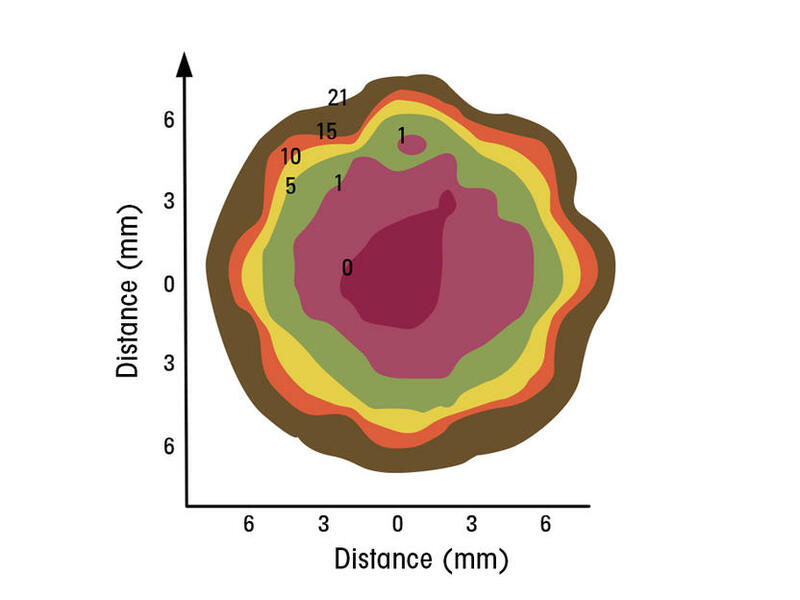 But although the travel speeds and distances relative to the organism’s size may be impressive, only millimeters or, at most, meters can be covered actively this way. This is far from sufficient to escape the adversities of changing environmental conditions. Therefore, bacteria need further strategies to deal with the ubiquitous uncertainties they face. Compared to bacteria, the metabolism of human beings is very limited and wholly dependent on oxygen. We humans can survive only for a few minutes without it – the world record for apnea divers is a mere 4 minutes and 24 seconds. Bacteria, however, have developed many different metabolic pathways to generate energy, grow and multiply under anaerobic conditions, i.e. in the absence of oxygen. They have had a very long time to do so, because over the first two billion years of life on Earth, no oxygen was available. At some point, the cyanobacteria developed the so-called oxygenic photosynthesis (other types of photosynthesis also exist), in the course of which water is split and oxygen is released. This “invention” has been so successful that it has changed the Earth's atmosphere for good, paving the way for species to emerge that depend on oxygen, as we humans do. However, many anaerobic habitats still exist today, particularly within soil, lakes and the sea. Living in such environments, seen to be “hostile to life" from our egocentric point of view, poses no problem at all for many bacteria. There are many different ways of generating energy without oxygen. Aerobic metabolism is based on the reduction of oxygen to water and the simultaneous oxidation of organic compounds, contained in foods from steaks to smoothies, to carbon dioxide. Reduction and oxidation are coupled (“redox reactions”) and signify the transfer of electrons. However, redox reactions may also occur between certain compounds in the absence of oxygen. And this is what bacteria use to generate energy; many species can grow under certain non-oxygenated (anaerobic) respiratory conditions. Other ways of generating energy without using oxygen are fermentations. The diversity of such pathways is also very high, to the frustration of microbiology students who have to learn them. But for bacteria, this means that it is somehow possible to live anywhere on Earth – and even beyond our planet: the survival of bacteria in space has been experimentally proven in space missions. Astrobiology deals with the possibility that life may exist on planets other than Earth. This variety of ways to produce energy is tantamount to a bacterial program for survival under a multitude of settings, even if these change frequently and rapidly. For bacteria, such uncertain conditions are not the exception but the rule. It would therefore be beneficial to bacteria if they could adapt quickly to changes. And that is indeed the case. Fig. 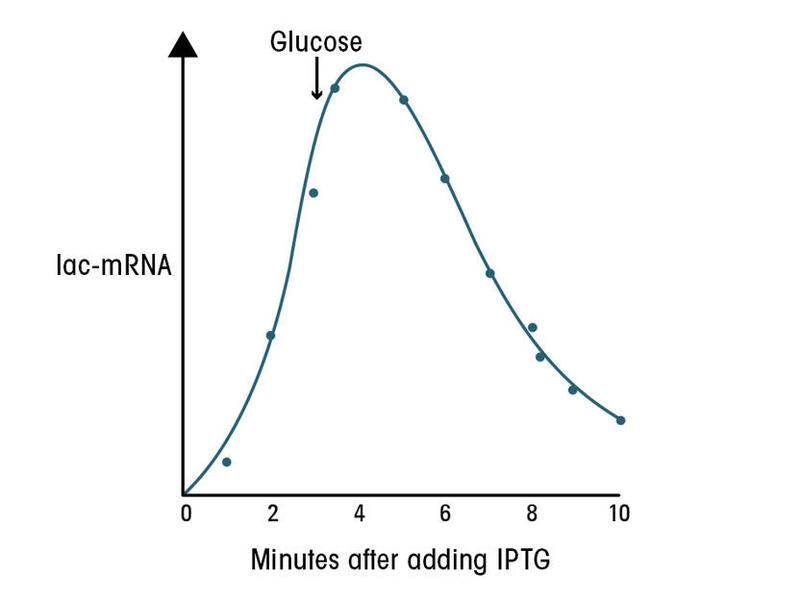 2 Induction of lac mRNA by lactose and degradation of lac mRNA after glucose is added, both with a very short half-life of about one to two minutes. The information contained in DNA is translated into proteins via messenger RNAs (mRNAs). These molecules determine the properties and capabilities of organisms, including the enzymes for their energy metabolism, cellular structures or receptors to perceive signals. Since it would be a waste of energy if all proteins encoded in the genome were permanently produced, reading them (“gene expression”) is strictly regulated. The lifetime of mRNAs in bacteria is very short, on average only two or three minutes. In contrast, the mean lifetime of mRNAs in higher eukaryotes as well as in humans is several hours. At first glance, it may seem wasteful to invest energy into building long molecules out of a thousand or several thousands of building blocks, only to degrade them two minutes later. But since this strategy has become established in the evolution of bacteria, it must offer advantages that outweigh the disadvantage of the energy it requires. A significant benefit is that it allows bacteria to react very quickly to changing environmental conditions. If oxygen or the energy source used are suddenly no longer available, the cells can almost instantly degrade the mRNA molecules that are no longer required. 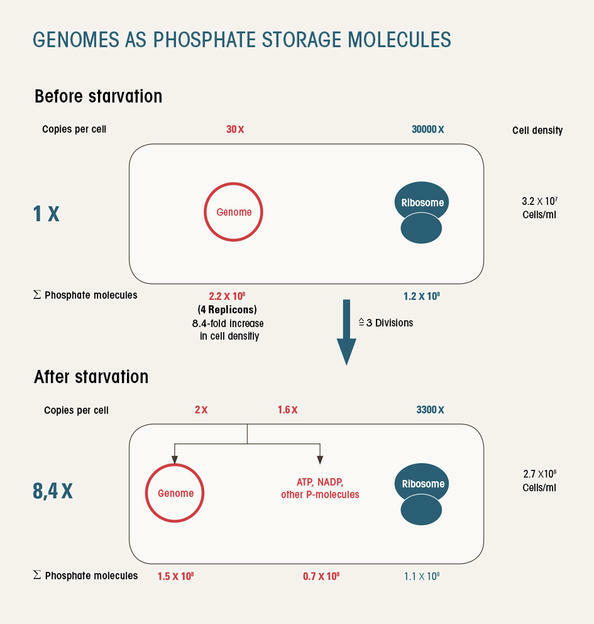 As a consequence, a few minutes after the change in environmental conditions, the now useless proteins are no longer produced (continuing would be much more energy consuming than producing mRNAs). Of course, adapting to changing environments quickly requires the appropriate genes to be switched in just as little time, and that's exactly what happens. 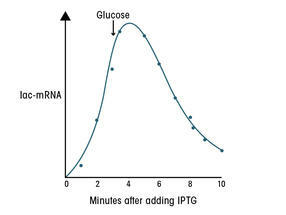 Figure 2 illustrates how fast mRNA can be produced and degraded using a well-characterized gene. It also shows that bacteria can offset signals from the environment against other signals. Fig. 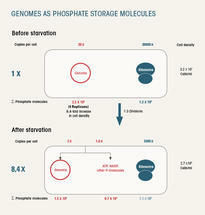 3 Phosphate molecules were quantified in DNA and ribosomes before and after growth in the absence of phosphate. Not all genomes present before growth are distributed to the daughter cells. Some are degraded to release phosphate for synthesizing other biomolecules. Relatively few elements make up the bulk of all organisms’ biomass. For human beings, these are – based on dry weight, so not including water – carbon (50%), oxygen (20%), hydrogen (10%), nitrogen (9%) and phosphorus (3%). If any of these elements are unavailable in a utilizable form, a versatile metabolism and rapid regulation abilities are not going to help. As conditions change frequently, microorganisms tend to experience “feast and famine” cycles in quick succession. One strategy that many bacteria have developed to bridge periods of shortage is to store substances that their “evolutionary experience” has taught them are often in short supply in their surroundings. Substances such as glycogen mainly store carbon (as well as oxygen and hydrogen). But there are also mixed storage compounds into which all the important elements are incorporated, such as the cyanophycin of cyanobacteria. Phosphate, consisting of phosphorus and oxygen, is essential for all organisms because it is needed for many different components of the cell, not least the DNA, of which 28 percent is phosphate. Only recently it was discovered that some bacteria use DNA as a phosphate reservoir, in addition to the nucleic acid’s role as genetic material. The cells can accumulate plenty of DNA in good times, making them polyploid. When conditions change and phosphate becomes unavailable, the bacteria can still continue to grow, as shown schematically in Figure 3. Monoploid species without the ability to accumulate DNA cannot grow when there is no phosphate. They live under the constant uncertainty of having to cease growing in the event of shortages. Fig. 4 Different types of dormant cells. A) Endospore formation in Bacillus. The bacterial cells (long dark rods) transform into spores (brightly lit short rods). B) Many cyanobacteria form filaments into which dormant forms, known as akinetes, are incorporated. C) The colonies of Streptomyces are structurally very diverse. At their edges there is a substrate mycelium that grows downwards and absorbs nutrients. The center lacks nutrients and an aerial mycelium is formed. This is where the spores and often also secondary metabolites (antibiotics, dyes) are synthesized. Many bacteria can form dormant structures under unfavorable conditions. To varying degrees, these can defy drought, lack of nutrients, aggressive chemicals and even radiation, which damages the genome of growing cells. Soil bacteria such as Bacillus and Clostridium transform individual cells into particularly resistant spores (Fig. 4a) that persevere for decades and return to growth only when conditions improve. A different strategy is pursued by myxobacteria, which live in swarms. Aggregation is essential to them as they release many enzymes to the outside in order to degrade nutrients in the proximity before these are absorbed. For individual cells, such food digestion strategies would waste too much energy for sustained growth. Myxobacteria must therefore survive in groups: under poor conditions, thousands of cells glide together and form fruiting bodies, in which many cells transform into myxospores (see header image). If at some point, perhaps only after years or decades, conditions improve, they will collectively revert to "normal" cells and form a new swarm. Two further examples of dormancy deserve a brief mention. 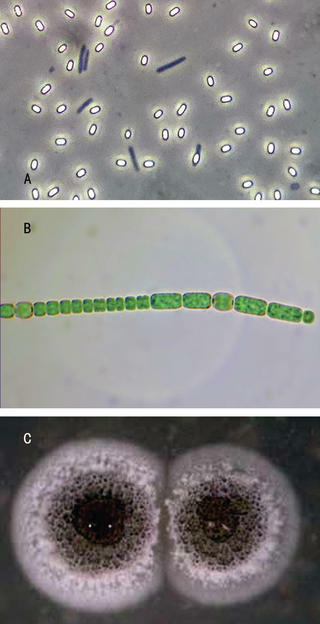 Cyanobacteria can form filaments of different cell types, into which dormant ones are incorporated and held in stock (Fig. 4b). Streptomyces form mycelia of not clearly separated cells. At the edges of such a mycelium there are a lot of nutrients and growth takes place. At the same time, the nutrients are used up in the center and a filamentous extension, the so-called aerial mycelium, forms (Fig. 4c). This is where spores are made, which are then dispersed by air currents. In addition to the four examples mentioned, there are many more bacteria that can form dormant cell types. It would go beyond the scope of this article to list all the adaptation strategies by which bacteria counter the uncertainty of ever-changing environmental conditions. However, three more strategies are worth noting. 1. It has been known only for a few years that populations of genetically identical bacteria can become heterogeneous, i.e. consist of individual cells with different characteristics. Currently the mechanisms for developing this heterogeneity are being investigated in a Priority Program of the German Research Foundation (http://www.spp1617.tu-bs.de/). 2. Many bacteria can form symbioses with other species. Each species contributes its respective strengths to jointly improve the survival chances of both. Bacteria that manage to live in symbiosis with plants, animals or humans can at least partially escape the frequently changing environmental conditions described above. 3. Pathogenic bacteria act similarly, albeit in a very unpleasant way. They specialize in living within a host – and at the host’s expense. The bacterial interactions with other species are extremely diverse and are a subject in their own right. Hopefully the brief descriptions have helped to show how diverse the mechanisms and strategies are that bacteria use to address uncertain environmental conditions characterized by frequent change. As is typical in biology, there is no single, all encompassing law of nature to explain it all – instead there is biodiversity. Their many adaptive mechanisms have allowed bacteria to populate all environments on Earth. They grow from -50˚C to +125˚C, with or without oxygen, on all continents, in lakes as well as the sea. Bacteria have even been detected in clouds. We can still learn a lot from them, above all to be flexible. This article is an online secondary publication of the original article by Prof. Dr. Jörg Soppa, published under the same title in “Forschung Frankfurt”, issue 2.2018, pp. 26–31.